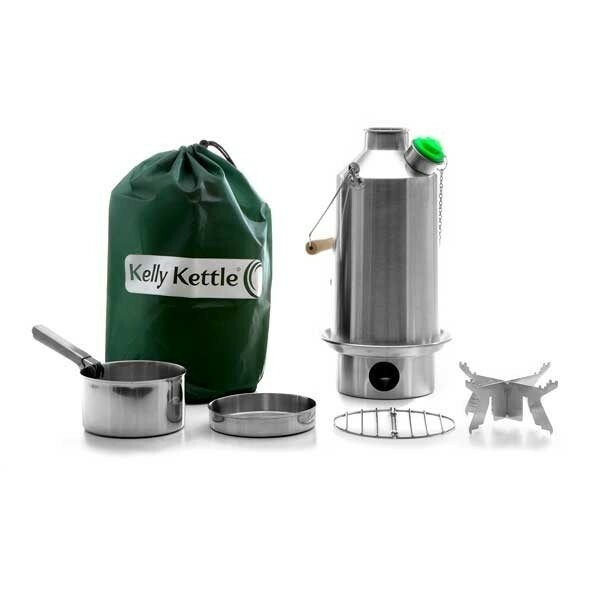 Comprising New Model 1.6 Ltr Steel Kettle + Cook Set + Pot-Support (all Stainless steel) + Whistle + Carry Bag. 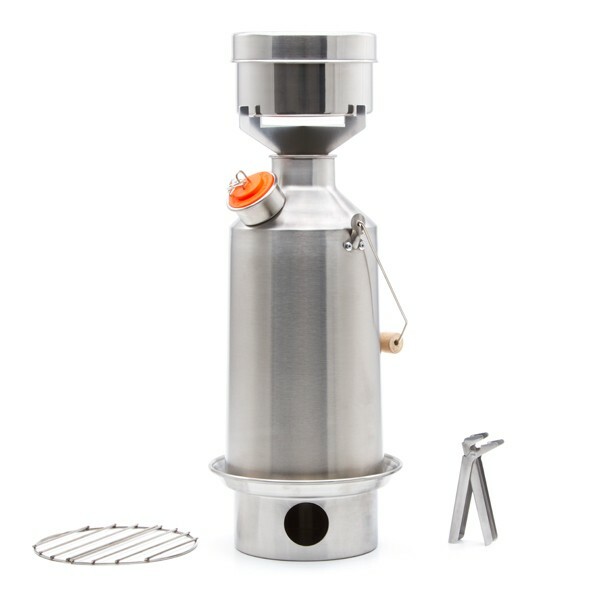 Note: Hobo Stove and Cup Set are NOT INCLUDED in this Basic kit. 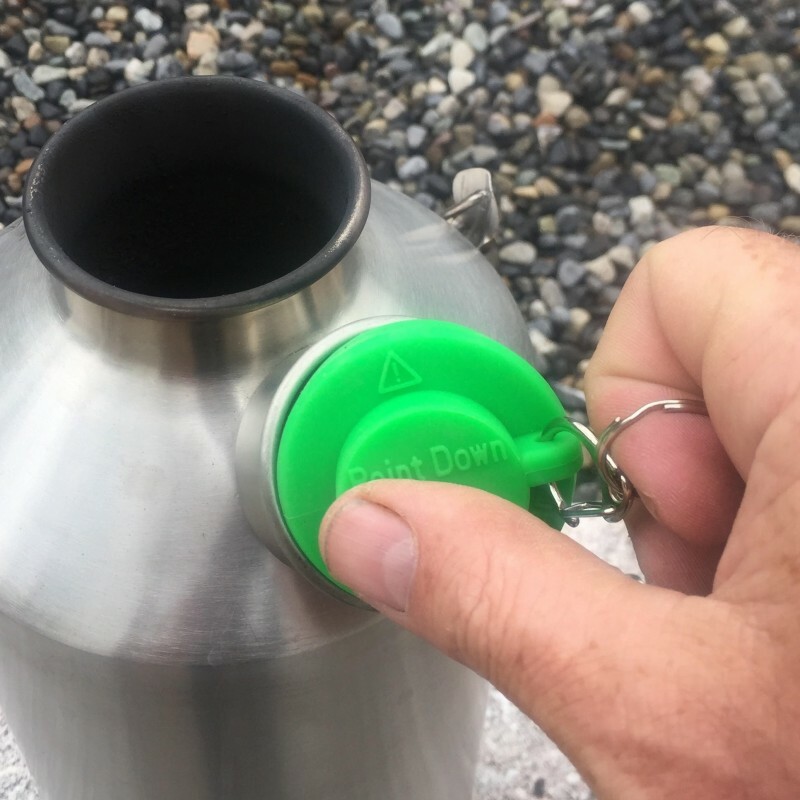 A popular Green Whistle has replaced the Orange stopper on this Kettle and will let you know when the water has boiled. This NEW version of the kettle has an all welded construction and no rivets. Suitable for Car Camping, Family Picnics, Scouts, Fishing, Hunting, Survival Kit etc. See Product Description below. 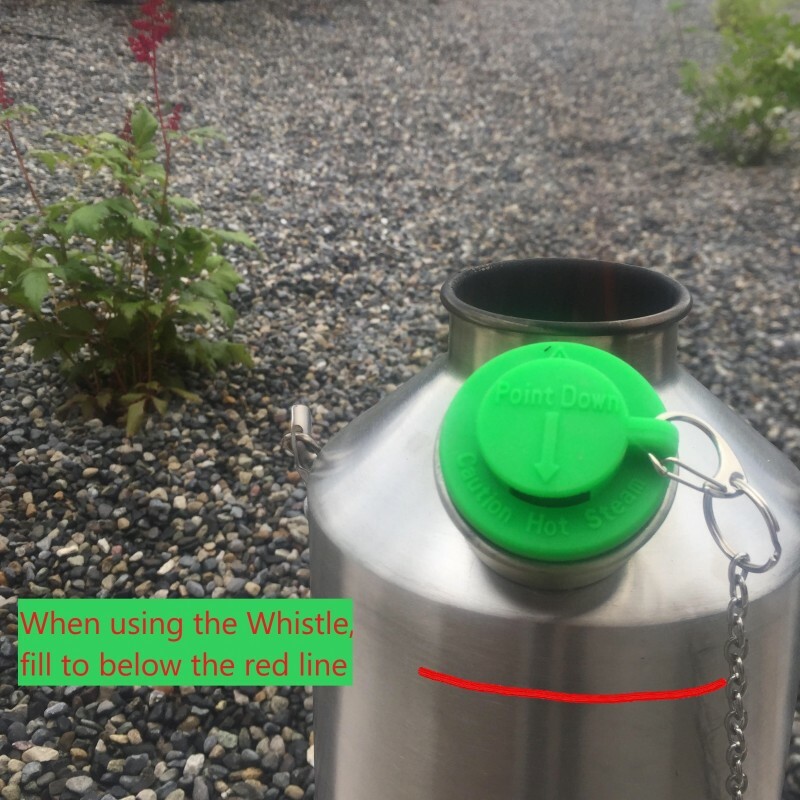 A popular Green Whistle has replaced the Orange stopper on this Kettle and will let you know when the water has boiled. All fit neatly within the kettle itself for transport or storage. A useful drawstring carrying bag is supplied with each kit. Cost-FREE to run! Never worry about running out of fuel again. Simply gather deadwood, twigs, dry grass, pine cones or whatever natural fuel you find lying around in the area and you can bring 6 cups of water to the boil within a matter of minutes while at the same time (and using the same fuel) cook small amounts of food over the chimney (using the pot on the support) as the kettle boils. Hence, a very small amount of fuel will both boil your water for hot drinks, washing up, personal hygiene, etc. and cook your meal at the same time! This kit works in ALL weather conditions. 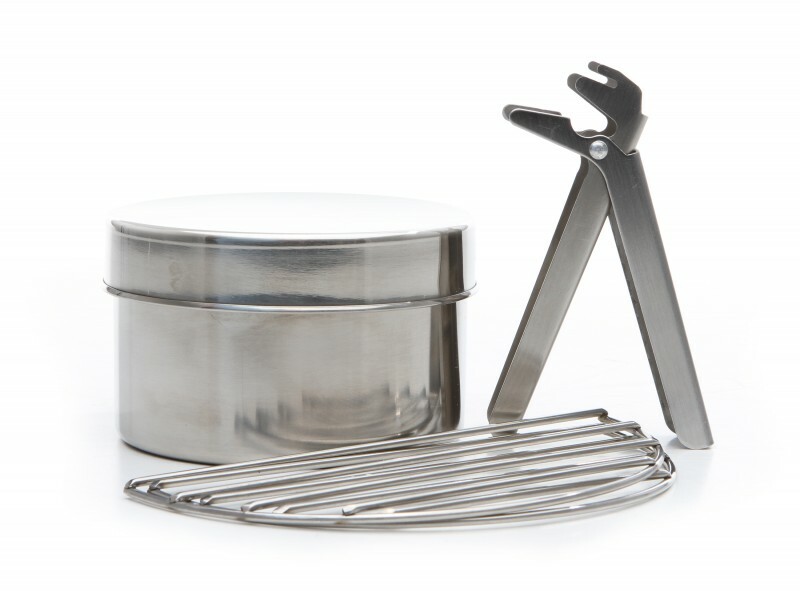 For more details on how best to use the Pot-Support and Cook set, please click here or go to our Frequently asked Questions page. 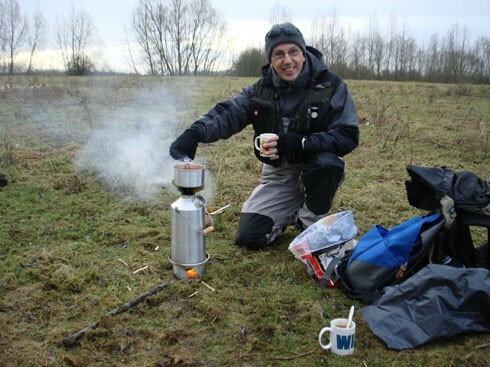 If more than 2.6 pints of boiling water are required (this kettle will easily and quickly boil water for 10-14 people within a matter of minutes) simply refill the kettle with water and place it back on the firebase. Refuel the chimney again and your kettle will boil again within approx. 3-5 minutes. 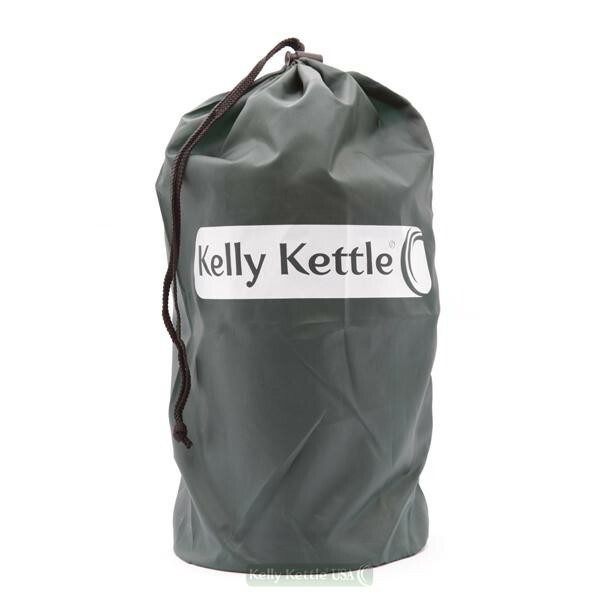 Fire Base & Drawstring carrying bag are included as standard with each kettle. Please note: Per our instruction leaflets, the Kettle is not designed to be a water carrier. It has been designed to boil water extremely fast in all weather conditions using very little fuel. When filled with water, the Stainless Steel Kettles should always be carried upright. If filled with water and carried on their sides or upside down, leakage can sometimes occur from the chimney top which is not always perfectly watertight. 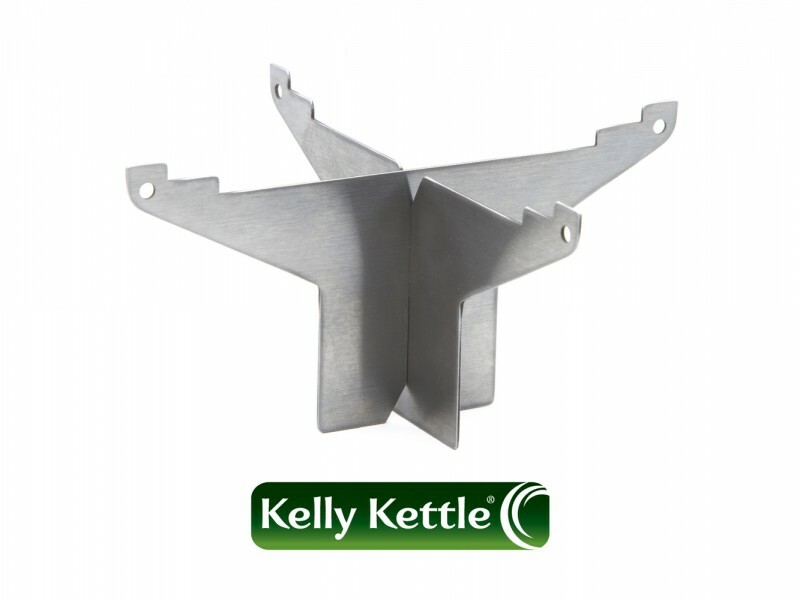 If for whatever reason you need to carry water with the kettle on its side or upside down, then please choose the Aluminium models which are easily sealed at the chimney top due to the softer metal. It really is a thing of beauty, absolutely love it :)Review by Roger, U.K.
All I seem to have done today is collect twigs, boiled water and sat making tea in the garden. I feel so chilled out, just watching the smoke. I do smell rather like a garden bonfire though...lol. The wind is light and variable here so no matter where you sit the smoke gets you. everyone needs one! !Review by the b.f.g. 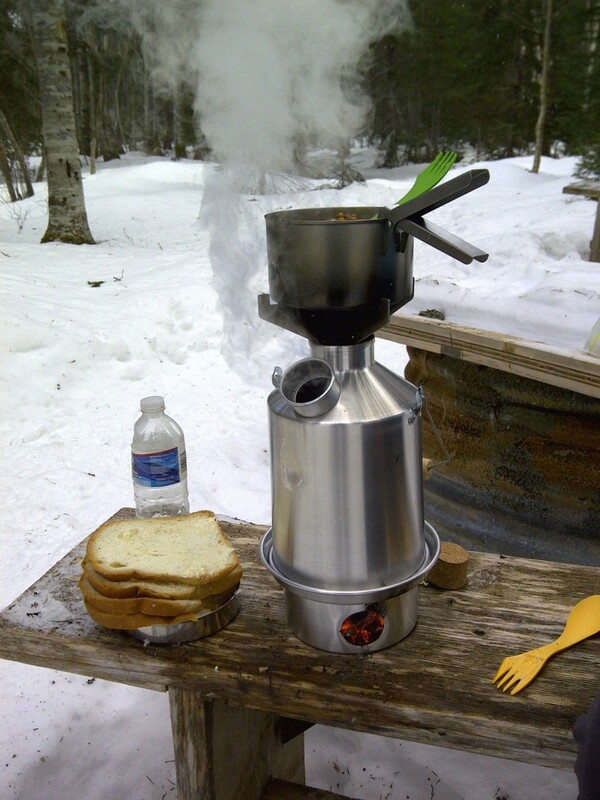 Hi I have a stainless steel base camp Kelly kettle which Santa delivered last year. It has been used a lot during the year on several scout camps and river canoe cruises. I like the simplicity of its design and how effective it is at doing its job. It lives in the back of my van so it is always at hand for a hot brew or tasty meal. I have also purchased the hobo stove and mug set to complete the set. Its a big thumbs up from me and i would recommend them to anyone. We tried it out and yes it does everything it said on the label, hot water in minutes with some sticks, leaves, straw, grass, anything that burns. We're very happy with it and if it doesn't rain too much this year, we'll put it to good use when we're camping. At the moment we boil the water in it to do the dishes! Great invention! Absolutely wonderful! Wish we knew of it existence when we first started camping way back in the sixties. I'd like to give you a thumbs up for your superfast service. Shipped 28th, arrived 31st in the Netherlands. That is amazingly fast. Besides that I noticed that shipping charges on the box were 10 Euro, whereas you only charge your customers 5! One hardly sees that in the internet shopping mall nowadays. I haven't had the time to try out the kettle yet, but will do so soon and hope to take it on a Bushcraft or hiking trip soon as well.